A diaper cake is a visually appealing presentation of useful baby items for the new mother or the Mom-to-be! 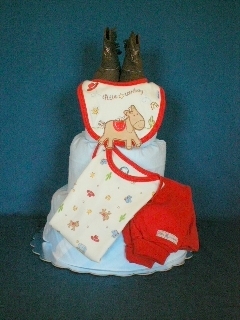 It is a unique baby gift constructed with the ever valuable disposable diapers and decorated with useful baby items. Finally, a different way to congratulate the new mom with many baby items wrapped up into one beautiful package! Each of our cakes is custom made using only Pampers diapers, not generics. We make our cakes using quality items. No cheap imitations here! We don’t use tapes or glues, so the new mom will be able to use each item. When you order a diaper cake, there's no need to fumble with baby registries, or worry the new mom won't like your gift. A diaper cake is a surefire hit! Our diaper cakes are available in a variety of sizes, from the perfect gift-giving cupcake and 1 layer sizes to the 3 and 4 layer sizes—excellent as a gift from co-workers or as a baby shower centerpiece. 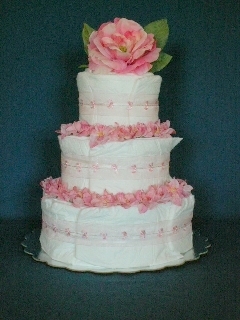 Our diaper cakes are also available in three styles: original, deluxe, and elegant. Please use the links above or below to view the photo galleries of cakes we've made. We can also personalize your cake by matching it to a theme chosen by the mom-to-be or one you choose yourself. We’ll gladly honor special requests. With us, your diaper cake possibilities are unlimited. All cakes come wrapped in a clear bag and with a bow ready for presentation to the new mom. Please be sure to allow 3-5 days for the creation of your cake. However, we do understand that difficulties arise, and rush service is available. Diaper Cakes Unlimited--the coolest baby gift idea ever invented! 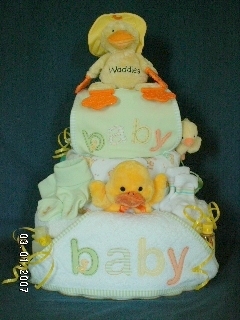 See our portfolio of diaper cakes by clicking the picture links below. *PLEASE NOTE: these are not edible cakes, but rather a unique and memorable gift!